Home / Lifestyle / Vaping Etiquette: Does It Matter? Vaping Etiquette: Does It Matter? 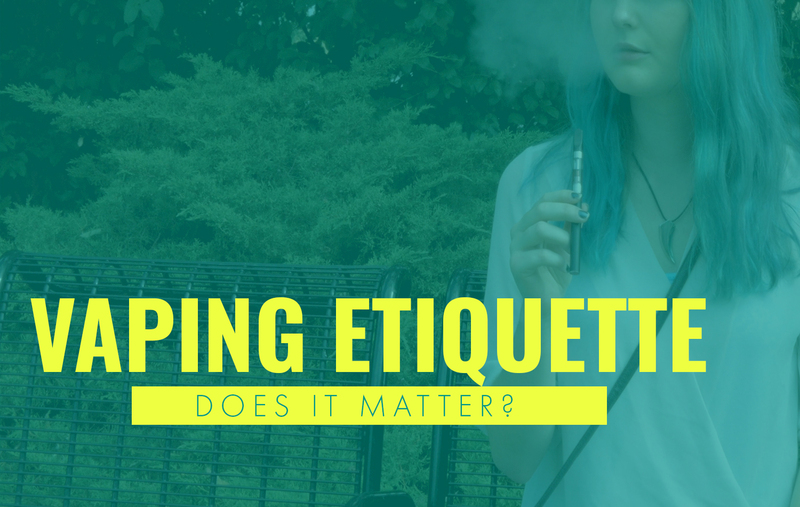 When it comes to vaping, etiquette is a huge factor us as “vapers” should have on our mind. Being respectful to those around us when we vape is important, as it can be intrusive and annoying. In this week’s blog, we are going to look at how to go beyond basic politeness when you vape in public. To those of us who might be puzzled by the subject of this blog, let me explain. With vaping being presented as a potential alternative to smoking, it has never been more popular. While the boost in popularity has been great for the industry, there are those of us who have given vaping a bad name, whether it was intentional or not. It could be as small as not noticing a kid near you when you take a hit while walking by, or it could be as big of an offense as blowing vapor in someone’s face: there are many ways to be annoying to those around us when we vape. While there is no “second-hand-vapor” that can take place from vaping in public, the reasoning behind being cordial is 100% social and 0% health-related. Also, there’s nothing wrong with being nice to others anyways. While you can vape at home, we don’t recommend vaping indoors in public. Most businesses, such as restaurants and department stores, all have rules regarding both smoking and vaping. Unfortunately, these regulations do apply even if it is a CBD vape. And while there are many benefits of vaping CBD, it isn’t worth getting kicked out of anywhere over. There can be obvious exceptions to this, such as being at a friend’s house, where respectfully asking permission goes a long way. This is not as much based on the health aspect, but more of being a good influence and safe. Vape pens are small and could cause hazards if not attended, both with pets and small children. Also, if a child sees you vaping, it could influence them to go out and try it themselves. They probably won’t know you are vaping CBD, leading them to vape nicotine-filled e-liquids. With how popular nicotine vapes such as Juul are with high schoolers, the fewer kids see us vaping, the better. We shouldn’t need to be told this, as it is a no-brainer in most circumstances. Never be the guy that sneaks in hits between doing his job, as it makes you less productive, and gives vaping a bad rap. If you need CBD during the day, going outside and taking a break occasionally should be more than enough. Anywhere from buses, subways, taxis, and planes are off limits. With rules surrounding these modes of transportation being strictly enforced, it’s better to be on the right side of the law. Obviously, your own vehicle isn’t subject to these. There is one major offense that comes into play with vaping, one that rises above all others. An act so disrespectful that when people look up “jerk” in the dictionary, they will find your picture. Never, and I mean never, blow vapor in another person’s face. Even when it could be looked at as a joke, it is never pleasant to be on the receiving end. When it comes to vaping, keep The Golden Rule in mind: “Treat other’s as you would want to be treated”. Be respectful to others, not only when we vape, but in general. And most importantly, if you spot someone blowing vapor in someone’s face, be sure to show them their picture in the dictionary.